BRAKES: You can’t brake any harder, better, faster or stronger. These high-tech Brembo babies are combined with lightweight wave discs made by Galfer. For 2019, the rear brake features a 10mm longer brake pedal and you get new, less aggressive brake pads all round. TRIPLE CLAMP: Top quality, CNC machined triple clamps have been a KTM trademark for years to ensure precise handling. For 2019, the upper triple clamp specifically features a redesign in conjunction with the new fork tubes. The rubber damped handlebar mount has also been reworked and the lower handlebar clamps are now separated, while on the upper side a new bridge-type clamp guarantees more torsional stiffness and can easily be replaced in case it gets twisted due to a crash. In addition, an hour meter is fitted at the upper triple clamp in order to let the rider know it’s time for a service. ENGINE & EXHAUST: The 450cc engine is the ultimate powerhouse when it comes to KTM's competitive motocross range. Significantly reworked for 2019, it features even more compact dimensions and reduced weight. It is fitted with a newly designed, extremely compact single overhead camshaft cylinder head and the latest electronic fuel injection. This enables the impressive 63hp to be distributed extremely efficiently throughout the rev range. Even with its super-beneficial electric starter this model is still the lightest 450 engine on the MX market. CYLINDER HEAD: Inside the SOHC cylinder head, an overhead camshaft controls four ultra-lightweight titanium valves via extremely rigid rocker arms, which are DLC-coated on the intake side. A configuration like this allows engine speeds of up to 11,500rpm; a baffling figure for a large displacement thumper. New lateral brackets, made of aluminum instead of steel, allow an efficient fixation of the engine to the frame and contribute to the bike’s featherweight feel. CRANKSHAFT: The 450 SX-F’s crankshaft utilizes a short connecting rod, which makes for an overall compact and lightweight engine with a snappy power delivery. A plain big-end bearing with two force-fitted bearing shells runs directly on the crank pin. The necessary oil feed for this bearing is ensured by the engine’s pressurized lubrication. This design is a decisive benefit in terms of the crankshaft service interval, which can be lengthened due to the plain bearing. So just pin it, all day long. TRANSMISSION: The KTM 450 SX-F uses a lightweight 5-speed transmission with gear ratios that are perfectly matched to the power delivery of its large displacement engine. The 1st and 3rd gears are treated with a special surface coating for better reliability. An advanced ´No Dirt´ gear shift lever design prevents mud and sand from blocking the joint of the lever and guarantees trouble-free shifting. All 4-stroke engines are fitted with a gear position sensor, giving the option of different engine characteristics for each gear. For 2018, the transmission shaft gets a stronger shifting star and a C4 bearing that has a bigger overlap in the case. This guarantees better reliability even in extremely tough operating conditions. CYLINDER AND PISTON: Inside the short cylinder, with a bore of 95mm, thumps a box-type piston made by CP. Its crown geometry is adapted perfectly to the high-compression combustion chamber, where its rigid structure and low weight shine. Thanks to the low oscillating masses, the engine is as snappy as it is strong. 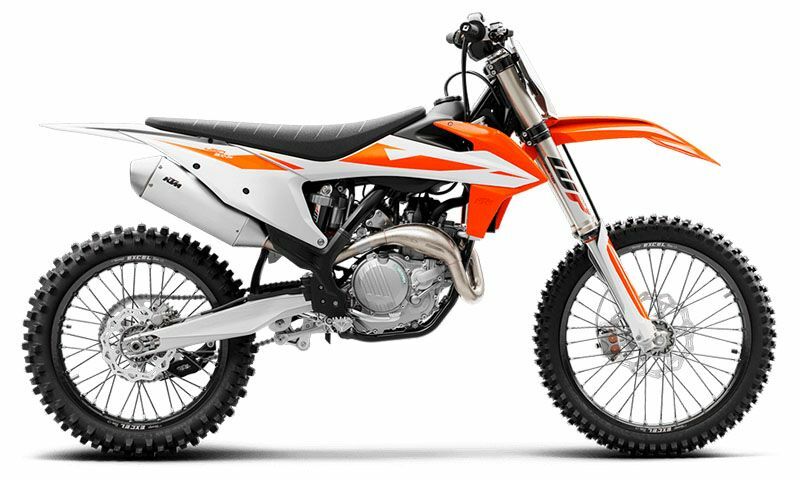 CLUTCH: The 450 SX-F employs the KTM-developed DDS clutch (damped diaphragm steel) with a wear-free steel basket and extremely heat resistant clutch plates. This clever design employs a diaphragm spring instead of the usual coil springs, making for considerably easier clutch action. A diaphragm spring also leaves sufficient space for a damping system to be integrated into the clutch hub. The goal is traction, but durability is as well. A lighter basket, a reworked inner hub and a pressure plate providing better oil supply and unsurpassed cooling up the longevity of the DDS clutch. Light operation and telepathic amounts of control are standard with this hydraulic Brembo actuated clutch. HANDLEBAR MAP SELECT SWITCHAll 4-stroke models are equipped with a sophisticated new multi-functional handlebar map select switch, which does three things: Activation of the traction controlActivation of the launch controlSelection of two power curves (Standard or Advanced)The traction control is a unique feature that none of the competitors can offer. It guarantees more efficient traction when the track conditions are less than perfect. Push the button and reign supreme. With this map select switch the rider can also activate the launch control, which provides more efficient starts out of the gate so you can go for the holeshot, time and time again. How? It simply reduces the maximum engine speed for the very first moments of the start, in order to give you better control. Push both buttons when the engine idles and the EFI control lamp mounted on the upper triple clamps will let you know you are READY TO RACE. In addition, the map select switch gives the rider the chance to select an alternative, more powerful map beside the standard configuration. Welcome to the future.